Custom-built behavioral monitoring stops ransomware before it can encrypt precious business data. Stops Ransomware. Before it encrypts your files. Emsisoft’s Anti-Ransomware protection layer is custom-built to detect behavioral patterns of ransomware attacks and stop them before your files can be encrypted. Other anti-ransomware solutions rely on detection of repeated encryption, so your most valuable files may already be lost before they act. Destroys annoying PUPs - one at a time In Internet security, “PUPs” stands for “Potentially Unwanted Programs”. These are unneeded browser toolbars, adware and other annoying software that typically gets installed with freeware software downloads. What can Emsisoft Anti-Malware for Server do for you? Emsisoft Anti-Malware for Server is not dependent on a logged in user to protect your data. The File-Guard begins to operate right from boot time. Emsisoft Anti-Malware for Server is provided with new detection signatures at least 24 times a day, ensuring the best protection possible. Your server’s hardware power belongs to your business, not to your antivirus. Emsisoft Anti-Malware for Server is very light on resource requirements. 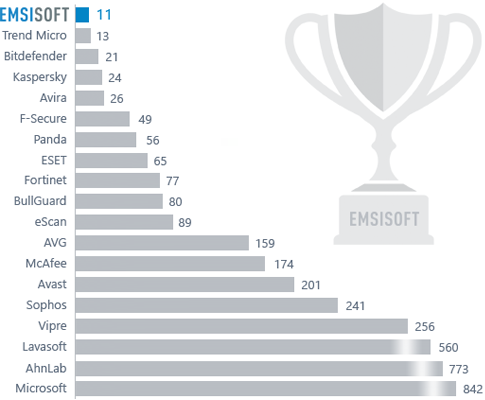 Emsisoft Anti-Malware has earned multiple VB100 awards, multiple MRG-Effitas zero-day protection victories and consistently shows in the upper quarter of all ongoing AV-Comparatives Real World protection and detection tests.